The combination of factors driving the FX market is a tangle. The Trump trade war and all its implications drive risk-off sentiment—dollar-favorable. But the trade war contributes to the development of a recession in the US, or at least a big loss of momentum, as shown above by the drop in capital spending. Expectations of recession are dollar-negative. The party that decides the tipping point is, of course, the Fed. And the Fed knows perfectly well that the trade war is contractionary for the global economy. The Fed's crystal ball on Trump's pending behavior is no better than anyone else's crystal ball. It's possible Trump gets a ton of concessions from China but declares it not enough when the 90 days is over, and goes ahead with raising tariffs from 10% to 25%, if holding in reserve tariffs on the other $265 billion. Or the other way around—keeping the existing tariffs at 10% but adding the other $265 to the tariff list. Trump seems to believe that the "Tariff Man" job description is a big selling point for re-election, and the campaign begins before China's 90 days are over. Like many others, we have little confidence a deal is going to get done and this chapter put behind us. So, risk-off and dollar firmness will come back, probably many times, over the next 90 days. Then there's the data. Again, we have to try to look at the data through the Fed's eyes. If we assume the Fed is looking for excuses to drag out rate hikes once December is done, it won't have far to look. First is payrolls. Today we get the ADP private sector jobs report, forecast at 190,000. The 6-month average is 199,000, so that would constitute a small slowdown, but we still think average hourly earnings will be the component on which to focus. Average hourly earnings rose a measly 0.2% in Oct. We would need a return to 0.3-0.4% as in Dec '17 or Aug '18, or more than Oct's 3.1% y/y, for the Fed to get excited about either inflation or household spending power. Then there is the trade deficit, and at the same hour today (8:30 am ET). It's highly likely to widen. The WSJ has $55 billion from $54.04 in Oct. This always happens—it gets worse before it gets better. Trump will not heed the J-curve effect and can easily go off on a twitter rant, scaring the horses. We also get the usual jobless claims, probably distorted by the California wildfires and other one-time factors. Finally, services PMI from Markit and ISM, plus productivity and factory orders. Weirdly, factory orders may contract, in part on seasonality but also previous-period uncertainty and tariffs. If you were on the Fed board, which of these would you choose to be the focus? The Fed's mandate calls for low unemployment (got it), managed inflation (got it), and financial market stability. To the extent the Fed accepts "blame" for the stock market turmoil, it might be said to have a responsibility to contain or ameliorate the turmoil. But to take any action or even to speak of the stock market runs counter to all the past history of the Fed for the last 40 years. It would be a tremendous shock for the Fed to act on the behavior of the stock market. Remember that Greenspan said you can identify a bubble only after it has burst and famously declined to change margin requirements because it would fall harder on the little guy than on the big institutions. We all have our grievances with Greenspan ("If you understood what I just said, I must have misspoken. "), but no one doubts his understanding of financial markets was far superior to (say) Trump's, or Powell's. In fact, if the turmoil persists, it won't be long before we hear of the Fed conceivably delaying the December hike. This would be a mistake of huge proportions, of course, because the Fed is one of the few institutions in which the public and indeed the world still have confidence. Therefore, won't happen. Right? It's 13 days to the next FOMC (Dec 19). The CME's FedWatch probability of a hike then is 76.6%--from 87.2% a week ago. Eeek. Wait, it gets worse. 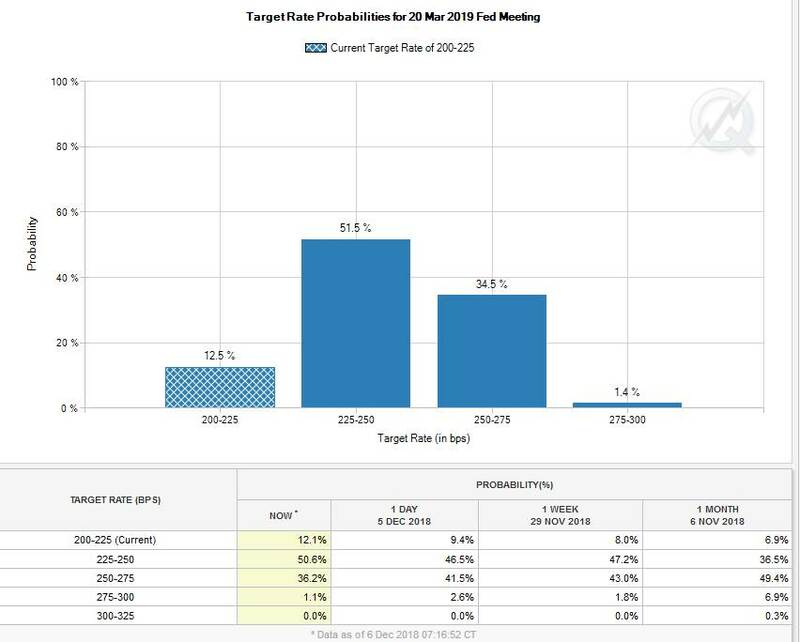 If we look at the probabilities for March 20, meaning Q1, the probability of another hike is only 36.2% from 49.4% a month ago. See the CME table. So, if the Fed provides the tipping point, it's tripping toward dovishness and that can't be dollar-friendly. What is dollar friendly—unwillingly, unwittingly--is Trump rhetoric on the trade war. Take your pick.